A multi-county citrus agent, Steve covers Hardee, DeSoto, Manatee and Sarasota counties. GAINESVILLE, Fla. — Steve Futch’s official office is located in Lake Alfred at the UF/IFAS Citrus Research and Education Center. But most days you’ll find him working out of his other office — his car — driving from grove to grove in his four-county area. “I go to meet or work with citrus growers and others to solve their problems or supply information to help with issues,” Futch says. His work day usually starts by 7 a.m. He rarely gets home before 6 p.m.
With his trademark mustache and wire rimmed glasses, Futch is an unassuming presence, but don’t let that fool you. 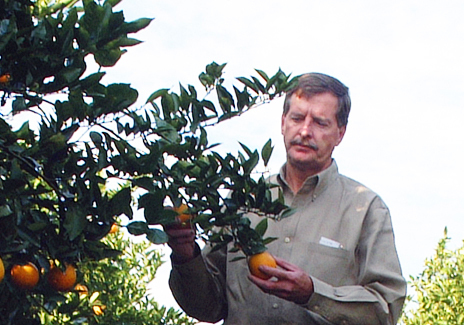 A UF/IFAS Extension citrus agent for more than 30 years, Futch knows Florida citrus. A multi-county agent, he covers Hardee, DeSoto, Manatee and Sarasota counties. And he’s dedicated to the region he serves. The day after Hurricane Irma swept the state, Futch left the Lake Alfred area and drove south, navigating flooded roads and closed highways to get down to Arcadia. Along the way, he documented the damage — flooded groves, fallen fruit, uprooted trees — and sent back reports to the UF/IFAS Extension network. Today he facilitates local WHIP meetings where growers get information on hurricane relief, or other grove visits or programs to offer assistance. He’s also been involved in a number of weed control trials and grants for citrus, as well as providing educational programs on citrus production, and pesticide rules and regulations. Whatever the day’s agenda, Futch’s goal has always been the same: to help Florida’s citrus industry be more productive. “The role of UF/IFAS Extension is to help find solutions in collaboration with growers. We are the conduit between University of Florida research and the industry,” he says. Over his career, he’s seen droughts, freezes and many other challenges to the citrus industry. But the threat of HLB is different, he says, because it doesn’t pick and choose certain areas within Florida citrus production regions. Everyone is affected. But when asked if there is a future for citrus in Florida, he thinks citrus is here to stay.